Cobblestones, also known as river stones, create a rustic, aesthetically appealing look and feel to landscaping. Laying cobblestone walkways, patios or driveways is a popular choice among both masons and homeowners. 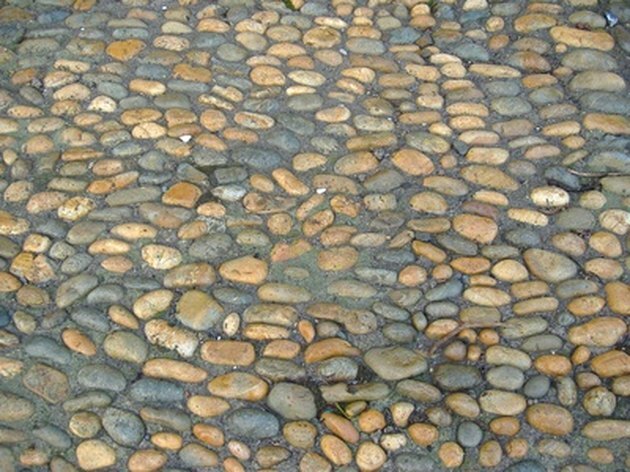 Cobblestones are large, rounded, naturally formed stones. A drawback to laying cobblestones on walkways is the stone does not offer a smooth, even surface, which makes them a potential tripping hazard. Smoother and flatter cobblestones, mined from riverbeds, are a safer choice, but generally more expensive. Cobblestone offers a durable surface for patios, walks and driveways. Measure and mark the area where the cobblestone structure will lie. Drive stakes into the ground around the perimeter. Dig a hole until the entire staked out area is 8 inches deep. Tamp the base of the hole with a hand tamper or gas-powered tamper. Pour 6 inches of sand into the base of the hole and level the surface. Drag the flat side of a metal rake across the sand to smooth high spots and fill in low spots. Place cobblestones on top of the sand bed by hand, one by one. Fit the cobblestones next to each other, leaving the least amount of space possible between each stone. Choose the flatter side of the cobblestone to face up. Think of it as assembling a giant puzzle. Place a flat board over the top of three to four stones and place a level on top of the board. If the bubble is out of center, tap the appropriate stone with a mallet to press it further into the sand until the bubble centers. Continue to move the board and level the stones throughout the entire structure. Mix dry-mix mortar with water in a wheelbarrow or trough until you achieve a thick, toothpaste-like consistency. Fill a grout bag with wet mortar. Place the tip of the grout bag in between the cobblestones and squeeze the bag, filling the void space between stones. 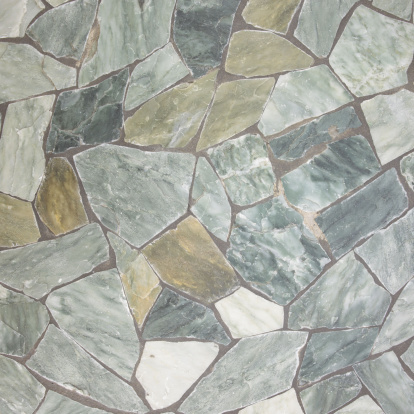 Move around each stone while keeping steady even pressure on the grout bag, squeezing out mortar in between stones. Continue to fill in the space until mortar lies between each stone.